Get a total dollar amount for your order from us. Once order is placed, you will receive a fax or email regarding your layout of your order. Please approve ASAP. We prefer Corel Draw 9.0, Illustrator 9.0, and Photoshop 5.0. We also except Quark 4.0, Freehand 8, Quality High resolution JPGs, and Microsoft Word Docs. Can You Take Archived Files? We will except .ZIP (pc) and .SIT (mac) files. What Quality of Graphics Can You Except? Vectorized files are preferred (Corel, Illustr., EPS files). Rasterized (bitmap) files should be 100% size of the final print and at 200-300 DPI. 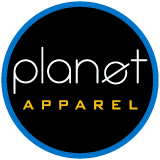 What File Types Can Planet Apparel Receive? .CDR, .EPS, .AI, .TIF, .PSD, .JPG, .WMF, .FH8 are the most typical. We are PC, however, we can receive Mac files. Please do not send Mac Fonts. We cannot convert them. Do You Have the Font Type for Our Logo? Not, necessarily. Please change all fonts to a graphic. Corel Draw (convert to curves), Illustrator (create to outlines). Please also send a JPG or a fax of your picture so we know what it is supposed to look for. How Do You Want Me to Send My Art? We can except art via email (Click Here to Send Art ). Please do not send files over 3 megs. We also except CD format, ZIP disks of 100 meg and 250 megs, and of course 3 1/2 diskettes.